I would like to examine different Buddhists attitude to vegetarianism. The simplistic picture – Hinayanists (Theravadins) eat meat and Mahayanists don’t – does not reflect reality. Although Theravada doctrine does not condemn meat eating, vegetarianism is common in Sri Lanka (although probably more due to the influence of Hinduism than Buddhism) but rare in Burma, Thailand, Laos and Cambodia. Some Mahayana texts advocate vegetarianism, although not all, and all Chinese and Korean monks and nuns and the more devote lay people are strictly vegetarian. Many other Chinese and Korean lay people will be vegetarian at least on certain holy days. Vajaryana texts do not advocate abstaining from meat, indeed some specifically endorse and even encourage it. Vegetarianism is rare in Bhutan, Tibet, Mongolia and also in Japan. There are two Theravadin justifications for eating meat. We have already discussed the ‘I didn’t see, hear or suspect that the animal was killed for me so I’m off the hook’ argument. The other one goes like this, ‘Monks get what they need by begging and should eat whatever they are given without picking and choosing.’ Like so much Theravada, this explanation of the theory bears little resemblance to the reality. The reality is, and I’m probably revealing a trade secret here, that monks nearly always get exactly what they want. When the average monk wants something he simply buys it or says to his supporters, ‘I need A, B and C.’ The more scrupulous monks will resort to hints, a slightly changed expression or insinuations. Either way, lay people are more than happy to provide monks with all their needs and most of their wants as well, and if a monk wanted a vegetarian diet he would get it without any difficulty at all. Theravadins traditionally do not use the 3rd point mentioned in my Vegetarianism I post (Feeling and acting with kindness towards living beings is a part of the first Precept) because the Theravada does not teach that meaningful concern for others has a spiritual significance. Likewise points 2, 4 and 5 (Trying to influence and encourage others not to harm or kill living beings and to be kind to them would be consistent with the first Precept. Not killing or harming living beings and being kind to them, is an integral part of the whole Dhamma, not just the first Precept. Eating meat is casually related to the harming or killing living beings and thus to the first Precept being broken) are not included in Theravada discourse on the meat eating-vegetarianism debate because its pedantic and literal interpretation of the Dhamma means that these points are not considered. So when it comes to eating meat, Theravada is not hypocritical, it is just narrow and selfish. Vajrayana (I will use the term Tibetan Buddhism from now on) is another matter. Most Tibetans Buddhists – living Buddhas, manifestations of Manjusri, rimpoches and tulkus included, don’t just eat meat, they consume it with gusto. Now when I read works on Tibetan Buddhism I find they the subject of compassion is nearly always mentioned somewhere; and so it should be. As if to emphasise its central position in Vajrayana, it is usually referred to not just as compassion but as maha karuna. Numerous commentaries on the Bodhicariyavatara linger with tear-jerking emotion on Santideva’s aspiration to willingly give his life for others. The practice of paratma parivartana ‘exchanging self with others’ forms an important element within the practices of all schools of Tibetan Buddhism. I won’t labour the point because I think you can see where this is going. Is there not a serious contradiction between the Tibetan Buddhist persistent and strong emphasis on compassion and the fact that they eat meat? I think there is. So Tibetan Buddhism may not be narrow but it certainly is hypocritical and inconsistent concerning this issue. Some years ago I was staying at Bodh Gaya, the Dalai Lama was due in a few days to give some teachings and the town was filling up with Tibetans. A friend and I decided to get out of town for the duration. As we drove to Gaya we found the road blocked by a herd of a hundred or so buffalos and goats being driven by several cowherds. Our driver hooted the horn, inched the car through the animals and when we got to the one of the cowherds asked him where he was going with such a large number of animals. ‘To Bodh Gaya. They’re for the lamas’ he replied. One would think that the least they could do is abstain from meat while they are at such a sacred place receiving teachings that almost certainly included calls to have maha karuna for all beings. Related to all this is a rather shameful hypocrisy that prevailed and indeed continues to linger in nearly all Buddhist lands. Butchers, leather-workers, hunters, fishermen and fowlers in Buddhist countries provided the community with various animal products including meat but were marginalized for doing so. 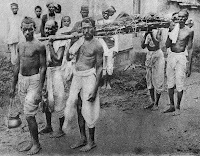 Costal-living fishermen in Sri Lanka were shunned by the majority and no monks ministered to them. Consequently these peoples were easily converted to Catholicism when the Portuguese arrived. Interestingly, soldiers, whose job was to kill humans, were never similarly ostracized. 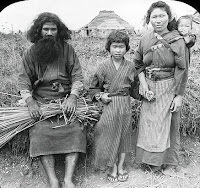 In Japan the Buraku were and still are treated as outcastes because they did slaughtering and other ‘unclean’ tasks. In Tibet a group of people (I do not know what they were called. Can anyone help?) were likewise despised because they made their living as slaughter men and tanners and were relegated to the outskirts of towns. I will stand being corrected here but I think they were also not allowed into temples. Interestingly, coracle men were likewise despised because their crafts were made of leather. Heinrich Harrer has some interesting comments on how the monastic hierarchy made these peoples’ lives difficult while benefiting from their services. Pious Burmese would never slaughter a large animal (cow or buffalo) but they think that killing small ones like fish, ducks or chickens is okay or that it only creates a manageable amount of negitive kamma. They let the Muslims provide them with their beef and mutton and despise them for doing so. So it would seem that meat eating is an issue that all Buddhist schools are yet to intelligently, consistently and compassionately come to terms with. Tomorrow, my own journey into vegetarianism. During our 25 years as vegetarians, we have had some odd experiences. In Japan we worked with priests from several sects who were very proud of their Mahayana vegetarian tradition but who weren’t themselves vegetarian. We, as Theravada Buddhists, however, always made teacher gatherings at our school difficult because we didn’t drink or eat meat (nothing that had a face). In Japan ordering vegetarian food was always tricky; one had to specify that a salad be without meat (meaning beef), chicken, ham, shrimp, fish, octopus, sausage, bacon, and squid. If one item got missed, it was probably going to end up in the salad bowl. But then again, let’s not be attached to views! “I cannot understand how a person can consider himself a Buddhist and want to eat meat.” <-- hmm, then I would reply to him, in a more extreme manner, I cannot understand how a person can consider himself a Buddhist and want to stay alive. Because, literally, our survival are the results of certain exploitation of other lives, in this cruel samsara. All you've written are "open secrets" which hypocrites like me do not discuss with monks. As for me, I still maintain that eating "dead" animals is not "killing". However I always qualify that being a vegetarian is very wholesome and healthy too. By the way I wonder where you got all those pictures. They are indeed very appropriate for the topics. * No meat is to be prepared in the kitchen of any Kagyu Monastery or Centre. * No one is to be involved in the business of buying and selling meat – for all of his students this practice must stop. * There is to be no killing of animals on Kagyu premises. * Karmapa is aware of monks in robes going to buy meat and does not want to see this ever again.